This book is not about imaging from the southern hemisphere, but rather about imaging those areas of the sky that lie south of the celestial equator. Many of the astronomical objects presented are also accessible to northern hemisphere imagers, including those in both the USA and Europe. 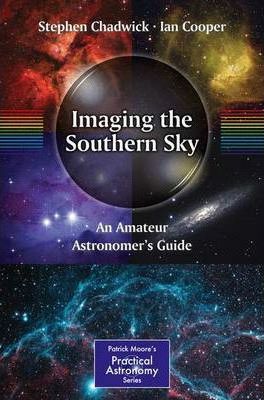 Imaging the Southern Sky discusses over 150 of the best southern objects to image, including nebulae, galaxies, and planetaries, each one accompanied by a spectacular color image. This book also includes sections on both image capturing and processing techniques and so makes an ideal all-in-one introduction. Furthermore, because it contains an in-depth study of how to capture all the objects, many of which are rarely imaged by amateurs and professionals alike, it is also extremely useful for the more advanced imager. Foreword by Sir Patrick Moore.- Acknowledgments.- Preface.- Section I: The Objects of the Southern Skies.- Chapter 1: The Hunter and his Dog (Canis Major, Eridanus, Lepus, Orion).- Chapter 2: Vast Explosive Remnants (Vela).- Chapter 3: The Ship of Srgo (Carina, Centaurus, Puppis, Vela).- Chapter 4: On the Serpent's Back (Antila, Centaurus, Corvus, Hydra, Virgo).- Chapter 5: The Emu (Ara, Centaurus, Circinus, Crux, Lupus, Musca, Norma, Scorpius, Triangulum Australe).- Chapter 6: The Heart of the Galaxy (Corona Australis, Ophiuchus, Sagittarius, Scorpius).- Chapter 7: The Deep South (Apus, Chamaeleon, Dorado, Octans, Pavo, Reticulum, Tucana, Volans).- Chapter 8: The Clouds of Magellan (Dorado, Mensa, Tucana).- Chapter 9: Galaxies in the Furnace (Aquarius, Cetus, Eridanus, Fornax, Grus, Sculptor).- Section II: An Introduction to Digital Astroimaging.- Chapter 10: Equipment Inventory.- Chapter 11: Acquiring the Images.- Chapter 12: Image Processing.- About the Authors.- Index. Stephen Chadwick originates from England but moved to New Zealand in 2004. The superb dark skies near Himatangi Beach, in the Manawatu, provide superb conditions for undertaking deep sky astrophotography of astronomical objects south of the celestial equator. Stephen has had images published in Astronomy Now and the BBC's Sky at Night magazine and is the president of the Horowhenua Astronomical Society. All the astro-images presented in this book were taken by Stephen over a two and a half year period. Ian Cooper has been active in amateur astronomy for nearly four decades. In that time, Ian has become a specialist in deep-sky observing and was very active in deep-sky astrophotography at a time when hypersensitizing film to enhance the film's capabilities was as good as it got. Being an amateur Ian was not strictly limited to deep-sky observing. Ian often contributed comet observations to the R.A.S.N.Z. Comet and Minor Planet Section, as well as acting as the North Island Coordinator of the Aurora & Solar Section of the R.A.S.N.Z. Ian has submitted over fifty auroral observations to that section from his home in the lower North Island of New Zealand since 1978. Ian is currently, and has been many times, the president of the Palmerson North Astronomical Society since he joined in 1974. Ian also holds the office of the vice-president of the Horowhenua Astronomical Society and the Phoenix Astronomical Society that covers much of the lower North Island. Ian Cooper is also a co-author of the `Night Sky Observer's Guide, Vol. III - The Southern Sky` (Willmann-Bell, 2009). This book proved a great source of detailed information to both authors as they planned their strategy for this book. Ian currently fronts an astronomical television show called `Southern Nights` for a regional television company.